Bird Nest In a Dryer Vent? WellDuct on How to Prevent Fire. Bird Nest In a Dryer Vent? How to Prevent Fire Hazard. 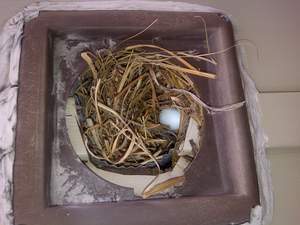 Bird nest in a dryer vent is a common problem for many homeowners. Nests are frequently constructed in places most predisposed to clogging and choking. Birds utilize eaves, dryers and stove vents in homes by constructing nesting cavities. Bird nests can reach up to 2ft of vent opening in length which gives rise to airflow obstruction leading to dangerous and unwanted consequences. Special bird nest removal tools are required to clean dryer vent and remove any excess material that builds up inside from birds nesting. Birds weave their nests inside the vents, which results in obstruction of airflow. Eventually, dryers overheat and stop working efficiently. Lint build-up is a primary culprit for obstructing airflow in the vent due to bird nests. If proper measures are not taken to remove the obstruction, a possibility arises for fire hazards and other unwanted consequences that we, as homeowners, want to avoid at all cost. When vent blocking occurs, lint clogs inside the vent, dryer runs less efficiently. This causes the dryer to fail. Bird nests block airflow and moisture droplets condense in the dryer exhaust, water leaks and results in stains on the walls as well as ceilings. When such fluff accumulates in the vent, it can cause a rapid and sudden fire. Clogging of the dryer duct, blocking of airflow and accumulation of dirt is the most common cause of fire in homes. To avoid such consequences, proper measures and precautions should be taken. Frequent inspection will reduce the possibility of dryers overheating and fire. Vent cover is one of the best and most simple solutions to the problem and should be taken as a precautionary measure by all homeowners. WellDuct technicians have years of experience and when it comes to problem with bird nest in a dryer vent, this is the name you can rely on. Bird resistant covers can be adopted in order to prevent nesting. The most common covers may be purchased at your local hardware store. They prevent birds from getting in to weave their nests. It is necessary and useful for customers to educate themselves about the importance of regular check ups and cleaning of dryer vents in their homes annually. It is important for clothes dryer efficiency as well fire hazard prevention. « Air Duct Cleaning Benefits: How to Reduce Allergies and Asthma. » Standard Way of Cleaning Air Ducts.